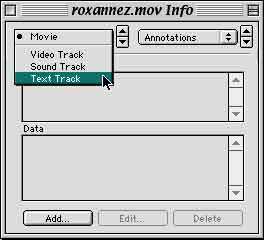 Create a text file of captions or subtitles. Add returns to break the lines into small chunks of text for each segment or thought. 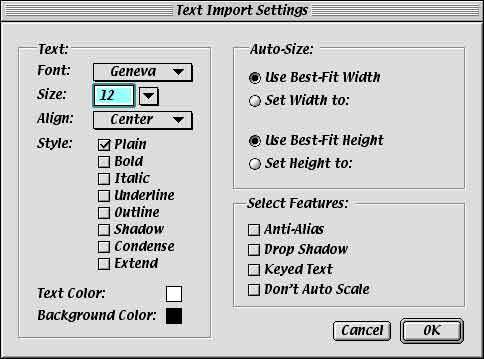 Select and copy the first line of text. This will place it on the Clipboard (or into buffer memory) to be pasted into your QuickTime movie. 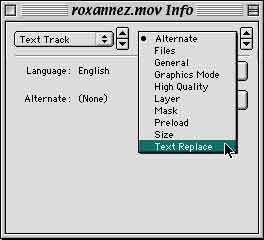 Open a .mov file in QuickTime Player. 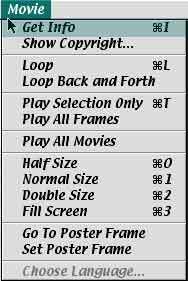 QuickTime Player is the application that displays QuickTime movies. 3 Hold the Option and Shift keys down and choose Add Scaled from the Edit menu. * This is the Paste function specific to time. This creates a Text Track for the entire duration of the movie. 4 Choose Get Info from the Movie menu. The Info window allows you to select the newly created Text track from the Movie pop-up menu. 5 Choose Text Replace from the pop-up menu. Position the Controller to select the next portion of the Movie. Hold the Shift key down while you drag the Controller or use the Shift and arrow keys to step-select the desired segment. 6 Select the the next caption, then drag and drop it onto the Info window and drop it when the Drop Text Here area highlights. The 'dropped' text replaces that portion of the text track. Repeat steps 5 & 6 with each caption. 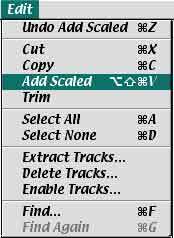 Holding the Shift, Option and Control keys will access these settings when you Add Scaled. View the QuickTime Movie version of this information. This project/tutorial was originally created with FAIS Librarian Catherine Sullivan. 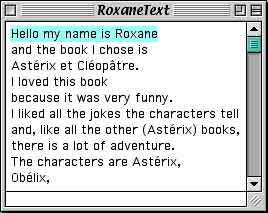 Our Promoting Literature/Reading with Technology/Bilingual Workshop was presented on Friday March 16, 2001 between 2:00-2:45 at the United Nations School in NYC. Catherine and I would like to thank you for attending our workshop at the Education Technology Conference last week. We returned to school on Monday and our first 'rolling blackout' at FAIS. Of course, reading continued without interruption, while technology was forced to take the afternoon off.